Most banks are in some stage of digital transformation initiatives that help them stay relevant in a highly competitive market. In fact, McKinsey & Co. estimates that "digital laggards" could see over a third of their net profit erode, while the leaders could realize a profit upside of 40% or more. But as financial institutions charge ahead with their adoption of digital channels for front-end sales, marketing, back-end operations and customer interaction, they must not ignore the dramatic increase in cyber security risk their digital transformation introduces. Join RiskIQ to learn about the ways cybercriminals could exploit banks' increased digital presence, and how to manage these enhanced levels of risk while realizing the benefits of your innovation. According to latest Verizon research, 73% of all breaches originate outside the corporate firewall on the Internet and your organisation's presence on the Internet has become the new cyber battlefield.. Forgotten, unmanaged and un-patched web infrastructure have long been targets of choice for cyber criminals but recently we’ve seen new and effective tactics designed to compromise organisations, employees and customers while avoiding detection with traditional security methods and tooling. In this webinar we’ll look at how the cyber battlefield is changing in favour of the adversary and we’ll outline the steps organisations need to take to regain control and reduce their Internet exposure. In 2015 a digital credit card skimming group that injected code into the online shopping software provided by Magento, dubbed ‘Magecart’ was first discovered by RiskIQ in 2015. In October of 2017 RiskIQ exposed the group’s offline operations, which monetizes its credit card theft and mitigates risk to its members by recruiting unwitting mules in the US via Russian-language job postings to ship stolen goods to Eastern Europe. RiskIQ then discovered the July breach of Ticketmaster was not an isolated incident as initially reported, but rather part of a worldwide campaign affecting potentially thousands of sites by hacking third-party components used by e-commerce brands. The latest chapter in the Magecart saga reveals the group’s role in the targeted breach of British Airways, which used malicious code meant to mimic the functionality of the site to intercept the payment information of 380,000 customers. The digital threat landscape moves too quickly for security teams to rely on disparate tools that slow down investigations and complicate protecting the organization. The time has come to embrace the power of a digital defense platform strategy to simultaneously reduce cost and business risk. How organizations should be leveraging “force multiplier’ platform technologies that provide unified insight and protection against threats across the Web, social media and mobile apps. Why a platform approach is the best way for resource-constrained information security departments to reduce both mean time to detection (MTTD) and mean time to resolution (MTTR) of digital threats. Customer mini-case studies that demonstrate the platform capabilities and ROI achieved. How the RiskIQ platform maps to the Frost & Sullivan Cyber Resilience Framework. For most security professionals, fixing vulnerabilities and security gaps can feel like a game of Whack-a-Mole. New threats come online; new weaknesses are exploited, old gaps are exploited, new vulnerabilities are disclosed. The process is challenging to manage and prioritise. But a strategy that includes automated, up-to-date analysis of your security posture, especially as it relates to internet-exposed assets can help calm the storm. In this webinar, we cover how a CISO professional looks at risk as it relates to your digital footprint, and how RiskIQ’s Risk Reporting is different from other Risk Scoring and Risk Reporting solutions. We also cover essential perspectives, methods, and capabilities that are important for any digital threat management programme. Join us for our webinar to learn more from Edward Amoroso, former CISO of AT&T and current CEO of TAG Cyber as he offers his advice on a comprehensive Outside the Firewall strategy. Visualising your organisation’s complete attack surface—all the known, unknown, and rogue and phoney digital assets across digital channels—is central to a robust and effective digital threat management (DTM) program. Having this complete picture also provides an understanding of vulnerabilities associated with those assets, and which should be prioritized highest (e.g., old vulnerabilities, which are the most often exploited, and new vulnerabilities like zero-days). - What is RiskIQ Digital Footprint? Also, you’ll hear from a RiskIQ customer and security chief on how he used Digital Footprint to improve his organisation’s risk posture. Businesses are accelerating their digital transformation, expanding their online presence to enrich products, deepen customer relationships, and boost their brand ecosystems. However, with this rapid growth comes security challenges as web assets get created outside of corporate controls and the overall Internet presence expands to unmanageable proportions. Cyber adversaries are taking advantage of this sprawling digital attack surface, looking forweaknesses to exploit. The attack surface has become the battle line between malicious actors and an organisation’s external threat defenders and its compromise is behind many of the breaches that get reported with alarming frequency. In an effort to highlight and quantify the risks which organisations have in their attack surface, we conducted research on the top 30 UK organisations (FT30) to highlight the issues we believe all companies face. We will present the various types of risk we uncovered and offer practical advice on ways to mitigate them and harden your attack surface. The care and handling of personal information is a top concern for consumers and governments alike. Unlike many issues which gain public attention and struggle to keep it, an endless stream of publicised data breaches serves to keep data privacy in the public eye. As a result we’re seeing increasingly onerous regulation coming into effect in an effort to improve the data management practices of organisations and protect the confidential information of citizens. Major Internet players are also weighing in in an effort to make the user experience more secure. For organisations with a large digital presence, identifying all the places that personal information, or in the case of GDPR, personally identifiable information, is collected can be a daunting task. Are those forms collecting data securely? Are they accompanied by compliant statements and controls? Research carried out by RiskIQ suggests that there is much more to do in this area. Join us for a closer look at the security and compliance issues surrounding the collection of personal information on the Internet and learn how you can automatically discover and assess all forms and persistent cookies across your web presence. Given the innovation and dynamics of web, social and mobile attacks targeting consumers and employees alike, progressive organizations are adopting machine learning and workflow orchestration to accelerate external exploit, adversary and exposure investigation and response. Beyond threat intelligence, where can security teams further automate, integrate and coordinate resources? Join SANS expert Dave Shackleford and Beckie Neumann, technical product manager at RiskIQ, as they share techniques and technology to empower security analysts and advance digital defenses. Earlier this year, RiskIQ reported an eightfold increase in internet scam incidents, which deny the $83 billion digital advertising industry millions of dollars. Since then, we’ve identified a particularly prolific threat actor that’s built out wide swaths of infrastructure to deliver millions of scam ads, threatening consumers and undermining the digital advertising industry. Based on the RiskIQ report released in April, NoTrove: The Threat Actor Ruling a Scam Empire, report author and RiskIQ Threat Researcher Ian Cowger and Technical Marketing Manager Benjamin Powell will walk you through how “NoTrove,” a scam actor named after its URI pattern and penchant for denying victims “troves” of rewards, uses its scam empire and advanced automation techniques to stay ahead of detection and takedown efforts. With GDPR fast approaching, do you know everywhere you’re collecting PII? The EU General Data Protection Regulation (GDPR) includes new requirements and controls on the online processing of personally identifiable information (PII) and large fines if poor practice leads to short comings in processing controls or lead to a data breach. RiskIQ’s recent research into leading UK organisations shows that there is still much to be done to comply with the regulation. - What are the changes to online information processing introduced by GDPR and how do they differ from current data privacy legislation? - What are the common issues organisations face to comply? - How can RiskIQ help? How mature is your organization’s digital risk management program? For many organizations, multichannel access to information, including web, mobile and social channels, presents new digital threats that are often overlooked. Join senior security analyst Nick Hayes of Forrester Research, co-author of The Forrester Wave™: Digital Risk Monitoring, to discuss digital risk monitoring and management. In this webinar, we break down a recent string of attacks against Polish banking institutions, which share traits with the 2014 assault on Sony Corp linked to the Lazarus Group. The example we examine reveals how this attack on the Polish Financial Supervision Authority is part of a larger international hacking effort. Third-party website resources and code play an integral role in the online economy. They enable interactive sites that allow people to transact with their banks; shop online, watch movies or television, share photos, videos, documents and much more. Unfortunately, these resources also represent exploitable infrastructure that sits outside the control of an organisation's IT security team. As a result third party web components have become fertile ground for launching attacks and distributing malware. Addressing this challenge requires looking at security from a new perspective. In this webinar we will explore the different kinds of third party code that organisations host on their sites along with their security implications. We’ll show how an outside-in approach to security can provide the controls organisations require while at the same time protecting their customers and employees. Social Media has come of age. Collectively, social platforms have attracted two-thirds of the world’s internet users with more joining every day. This ubiquity has led many organisations to make social an integral part of their digital channels strategy, along with their web presence and mobile apps. For organisations engaging in social media, the importance of having an advanced social media strategy is more critical than ever. * The attack methods hackers use to exploit social media platforms and profiles. * Which weaknesses cyber criminals look for so you can protect your company’s social media reputation. * How to strengthen your security approach to combat social media threats. * The defense techniques an organization must employ to prevent social phishing attacks, brand impersonation, recruiting scams, customer service impersonations, malware attempts, RDC, and more. The size, complexity, and dynamic nature of the global app store ecosystem make it increasingly difficult for brands to monitor their mobile presence and protect their customers from fraud. Once published, mobile apps can rapidly proliferate from official stores throughout the app store ecosystem, spreading to new stores and web download locations without the developer’s knowledge or consent and increasing the threat of apps being exploited, attacked or copied. - Examine year over year RiskIQ research on mobile apps owned by or leveraging the brands of top UK organisations. Every day, threat actors send hundreds of thousands of malicious emails across the Internet to the inboxes of their targets. Subjects range from ad campaigns soliciting views of a particular product to sophisticated attacks masked as friendly correspondence between colleagues. For security analysts, these emails offer an immense source of information—particularly infrastructure data. RiskIQ’s PassiveTotal harnesses the power of big data analytics to surface the footprint of an attacker, making threat investigations and incident response quicker and more efficient than ever before. In this webinar, Brandon Dixon, creator of PassiveTotal, will break down a malicious email in real time to shed light on its nefarious sender. Don't already have a PassiveTotal account? Sign up here for free so you can follow along with the live investigation during the webinar. While their cyber tactics may be continuously changing, bad actors can’t avoid interacting with core components of the internet. These interactions leave a trail that when connected through rigorous threat infrastructure analysis, can reveal the full scale of an attack and provide the information needed to determine the best response. The key to this analysis is access to a variety of global datasets and the ability to correlate and pivot between them in your investigation. In this two part series we will look at a range of global datasets and how each can be used to shed additional light on your adversary’s infrastructure. This session will focus on SSL Certs, Host Pairs and Trackers. We will also demonstrate how security analysts can use the free community version of RiskIQ’s PassiveTotal to gain access to and pivot across these global datasets. Subdomain infringement degrades consumer trust in your brand and puts your customers at risk of giving up sensitive, potentially damaging information. Unfortunately, the traditional way of monitoring registrations leaves a lot to be desired—most don’t dig deeper than root domains, leaving the millions of fraudulent subdomains in use by threat actors undetected. The network perimeter that organizations have long relied on for protection from cyber-threats has evaporated. Businesses are engaging with their customers, vendors and partners across web, social and mobile channels. Threat actors are following suit, increasing the digital risk that organizations face. 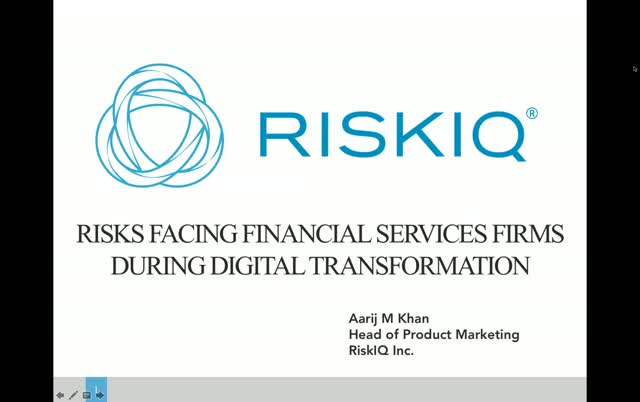 According to The Forrester Wave™: Digital Risk Monitoring, Q3 2016 (which cited RiskIQ as a Leader):,”Without comprehensively and persistently monitoring risk in digital channels, companies remain susceptible to a wide variety of brand, cyber, and physical risk events”. Every CISO and security leader must consider implementing a Digital Risk Monitoring strategy, or be at risk due to their expanding attack surface. Join this live webinar to learn more about this growing digital risk landscape, and how you can help better protect your organization’s most critical assets, its customers, and brand.